M. GAZZAH1. F. Khedher1. B. Jaouachi1. This study deals with a geometrical model of 602 cover-stitch plain used to seam decorative and esthetical parts of garments such as T-Shirts, denim pants, jackets etc. For industrials, the consumed sewing thread, as one of the most important components of sewed garments, remains a difficult problem for different reasons. First, the unsuitable used method to calculate the needed thread length value to seam garment regards different hypothesis. Second, the high waste percentage caused during different seam steps, which allows us to obtain the uncertain consumption value. Based on 602 cover-stitchs geometrical shape, a geometrical model to calculate the relative consumed sewing thread length has been derived. This developed geometrical model is successfully established mathematically considering different significant parameters such as stitch length, stitch density, sewing thread thickness and fabric thickness and interlacing. To improve findings, the proposed model was verified for 30 samples by comparing actual thread consumption value with predicted one. In fact, this model predicts the thread consumption with 97.96% accuracy. The consumed amount to seam garment part using 602 cover-stitch can be widely predictable and useful in the experimental area of interest..
N. BAAKA1. W. HADDAR1. M. BEN TICHA1. M. F. MHENNI1. The purpose of this work envisages developing an eco-friendly technology by the application of renewable biomaterials as a source of natural colorants for dyeing textile substrates. In this study, natural dyeing extracts for textile ﬁbres were obtained from grape pomace, a by-product generated in the winemaking process and from olive trees pruning wastes, a native species from the Mediterranean basin. The wool fabrics were dyed with different extracts (acidic, aqueous and alkali extracts). Olive leaves extracts gave greenish shades and grape pomace extracts gave brownish shades. The wash and rubbing fastnesses of dyed wool samples were found to be within the range of 4 to 5 means fairly good to very good level. The ultraviolet protective properties of the textiles fabrics dyed by grape pomace and olive leaves aqueous extract were also investigated. . In this work, we study the adiathermic property of knits related to thermal comfort. This property is a function of the structural parameters of knits, dealing with permeable porous media conveying energy and matter. The adiathermic property is related to porosity and air permeability..
M. GAZZAH1. A. BEN FRAJ 2. B. JAOUACHI 2. F. SAKLI1. 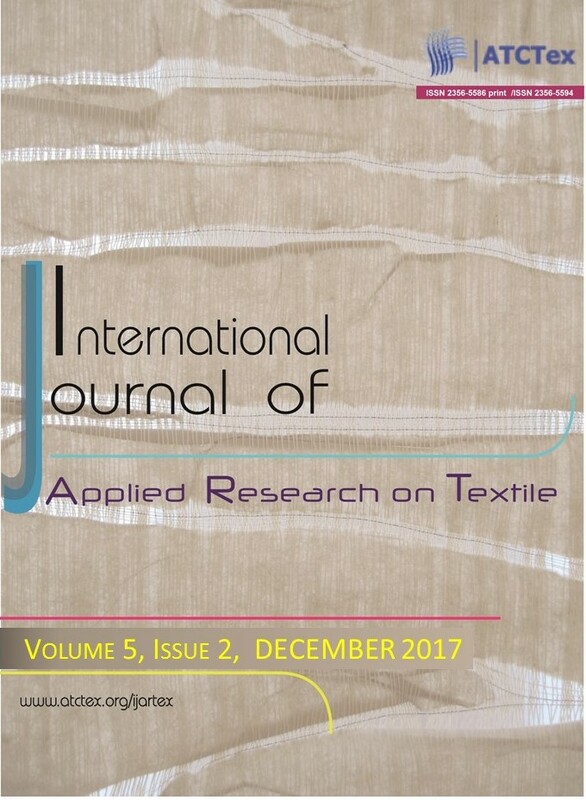 This paper deals with the evaluation and prediction of the residual bagging behaviors of denim fabric specimens. It also provides the impact of each frictional input parameter in our experimental field of interest to simulate the bagging phenomenon after several denim clothing uses. Hence, we attempt to formulate theoretical models of predicting bagging behaviors. Therefore, two soft computing approaches, artificial neural network (ANN) and the fuzzy inference system (FIS), have been applied and compared. The prediction accuracy and performance of these models was evaluated using the correlation coefficient (R), the root mean square error (RMSE) and the mean relative absolute error (MRAE). The obtained results show the modelsâ€™ ability to predict the bagging behaviors of denim fabrics from the frictional parameters. Therefore, according to the analytical findings, the comparison of the modeling technique prediction performances shows that fuzzy models give a more accurate result than the neural network models. .